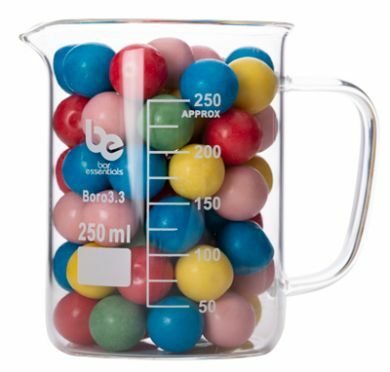 Bar essentials brand 250ml tall form beaker with handle. Made from borosilicate glass, graduated with pouring spout. Diameter of top (rim outer): 76mm. Diameter of body (Outside Diameter): 71mm. Numbered graduations: 50ml, 100ml, 150ml, 200ml, 250ml. Non numbered graduations: 75ml, 125ml, 175ml, 225ml.